Algernon Evelyn Hemmings was born in Oxford on 12th August 1883 where his parents James and Fanny (nee Stowe) lived in the St Ebbes district. He was educated in Oxford but was employed as a stoker at Gosport gas works when he married Ada Langridge in July 1907 at Alverstocke Church, Hampshire. 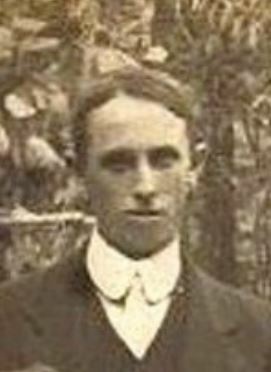 By 1912 when he joined the Dorset Regiment as a territorial they had three children and were living in Gosport. In 1914 Algernon was working at Thame gas works and the family were living at 5 Windmill Road, Thame. Their youngest child Gladys Blanch Hemmings was born in Thame on 7th March 1914 and baptised at St Mary’s on 16th December 1914. Algernon served with the Expeditionary Force in France from 14th August 1914; Private 7446 1st Battalion the Dorsetshire Regiment. In February 1915 he wrote. He was wounded at the Battle for Hill 60, southeast of Ypres (April 1915) and evacuated to England where he died of his wounds at York hospital on 15th June 1915. By this time his wife and five children had returned to live in Gosport and so it was there that he was buried a few days later. 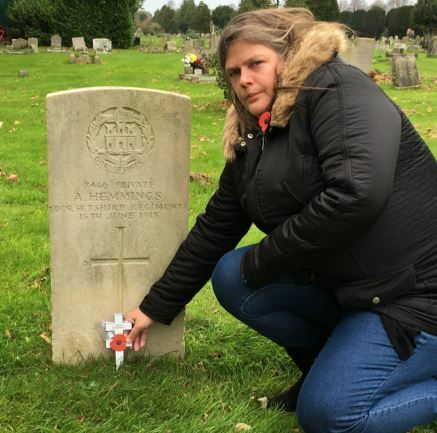 7446 Private Algernon E Hemmings, Dorset Regiment is buried in Ann’s Hill Cemetery, Gosport, Hants. He is remembered in Thame on the war memorial and on St Mary’s and All Saints’ memorial boards.